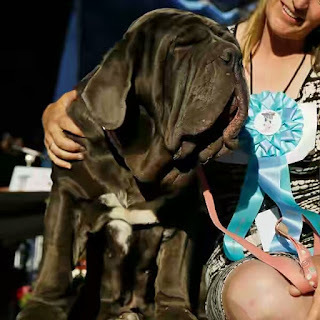 And the World's Ugliest Dog of 2015 is...Martha, a Neapolitan Mastiff. In a competition usually comprised of tiny dogs, the 3-year-old, 125-pound dog beat out 13 other pups to take home the top honor of being dubbed "The Ugliest Dog in the World" at the Sonoma-Marin Fair in Petaluma, Calif on Friday. Not every lady would like this as a bio, but the trophy-winning champ's short description on the contest's website lists: "125 pounds of drooling, snoring, gassy, loud and silly girl." The dog's owner, Shirley Zindler, rescued the big girl, who went nearly blind from neglect, from a California rescue group. Since being taken in, Martha has undergone surgery and her eyesight has improved. In addition to the top honor, Martha's family was awarded $1,500, a flashy trophy and a trip to New York for press appearances. NBC News reports that judge Kerry Sanders asked the gassy gal, "Do you know you just won the World's Ugliest Dog Contest?" Her handler answered for her: "I'd gloat, but I need a nap." The CEO of the fair said in a statement on the competition, which is comprised of many shelter and rescue dogs, that, "We’re proud to celebrate all dogs and pets by showing that no matter their imperfections, they are adoptable, lovable and a great addition to any family." The oldest dog in the competition, Moe, a 16-year-old Brussels Griffon-pug mix, was runner up, reports the Associated Press. Chase, a 14-year-old Chinese Crested-Harke mix, went home with third.